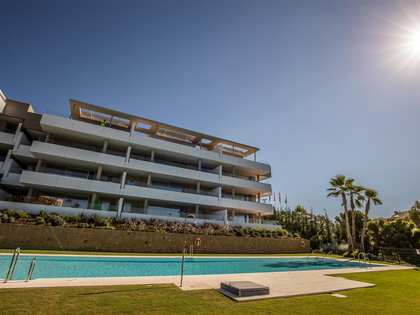 This property is part of the Benahavís AQ: stylish apartments and penthouses in Marbella. 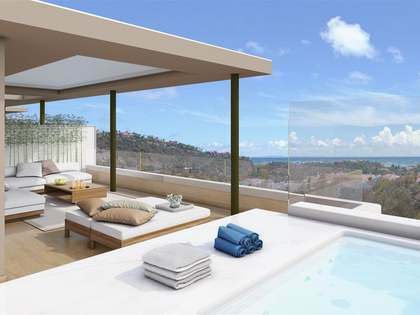 2, 3 and 4 bedroom apartments and penthouses with spectacular views for sale in Benahavís on the Costa del Sol. The elegant Aqualina Residences offer this 2-bedroom south-facing apartment. 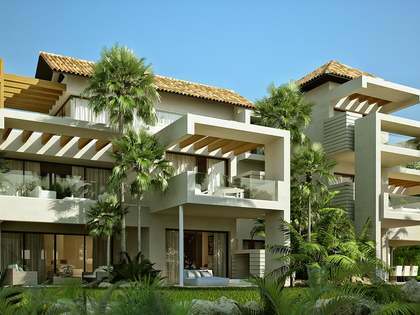 The whole development consists of just 5 buildings which fan out providing independence and outstanding privacy. This ample sized unit of 113 m² has a large open plan kitchen / living room, offers 2 good sized bedrooms, one of which is ensuite, and a second bathroom. A large terrace of 44 m²and the latest designs mean that owners can enjoy panoramic views whether on the terrace or inside the property. Light, spacious open plan interiors are both modern and neutral in tones letting natural light flood in. All bedrooms feature high quality fitted wardrobes and there is an emphasis on outdoor living in this upmarket development with spacious terraces that connect seamlessly with the interiors. Call us today for further details. New Development perfectly located to enjoy life on the Costa del Sol to the full. Marbella's excellent shopping and the styling Puerto Banús are close by as are some of the area's best golf courses including El Higueral, Los Arqueros and La Quinta.